On March 27 and 28, LA Sonic Odyssey presented Legacy, a program of early electronic music primarily from the 1950's, at Pasadena's Neighborhood Unitarian Universalist Church. The focus was on spatialized music, with Stockhausen's Kontakte as the centerpiece. The concert began with Cage's Williams Mix, which I had previously only heard on the 25th Retrospective Concert album. Originally realized in the the studio of Louis and Bebe Barron, this piece was presented in it's original 8-channel glory, a rare treat for this and many of the pieces on this program. Next was Xenakis' Diamorphoses, a piece composed at Pierre Schaeffer's influential GRM. Varese's Poeme Electronique followed, and both of these pieces were treated to a live spatialization by artistic director Jennifer Logan. With the inclusion of Poeme Electronique, one would expect Concert PH to accompany it, but LA Sonic Odyssey decided on Diamorphoses instead. Ligeti's Artikulation followed, which was written in stereo and presented as such. This piece can be connected to Kontakte by having been composed at WDR, the same studio where Stockhausen's piece was made. Though Bülent Arel's Stereo Electronic Music No. 2 was composed in 1970, it seemed aesthetically aligned with Kontakte. An underrated composer, Arel's piece is the only one on the program not included in UbuWeb's "History of Electronic/Electroacoustic Music (1937-2001)" page. It was an interesting programming decision, with more obvious choices being pieces by the likes of Schaeffer, Berio, Maderna, Babbitt, Tenney, Henry, Ussachevsky, Luening, etc. It's relevance to the rest of the program can be found in it's being the sole representative of the Columbia-Princeton Electronic Music Center. After an intermission, Stockhausen's Kontakte was presented. It was undeniably the most exciting to hear in it's original spatialization. I had only heard the piano/percussion version live before, a performance that used only stereo electronics. 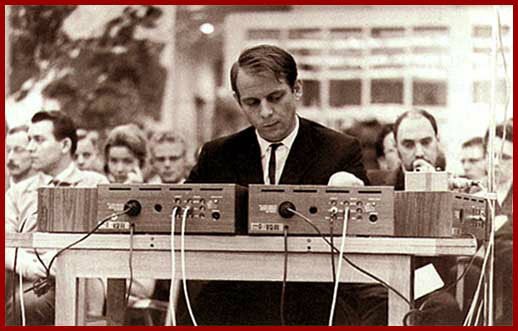 While Stockhausen's mythocracy can be distracting and his views are sometimes controversial, Kontakte demonstrates why no one disputes the Germanic genius of his artistry. The serial gestures sound like an extension of the symphonic aims of composers like Mahler, abstracted and distilled to an extremely potent concentrate in true post-WWII form. There are also plenty of spinny sounds, so the more visceral listeners can be just as entertained as the intellectuals in the audience. It is surprising that after 60+ years, these sounds still sound as alien and abstract as they do. LA Sonic Odyssey's concert was the second time in roughly a month that multi-channel electronic works by Stockhausen and Cage have been presented together in LA. I recently reviewed Southwest Chamber Music's presentation of Stockhausen's Nebadon Aus Klang, paired with Cage's Muoyce II: A Reading Through "Ulysses" at Zipper Hall as part of their LA International New Music Festival. There must be something in the air. Though LA Sonic Odyssey concerts seem to be few and far between, I look forward to the next one. Hear Schönberg's pentatonic Pierrot l'Ane!